We always carried the small boxes of dehydrated hashbrowns when we travel. This is a great way to make a quick and healthy breakfast. Any vegetables can be substituted for the broccoli and the entire flavor profile can be changed by substituting mexican, cajun or other seasoning. I buy a lot of spice mixtures from the Savory Spice Shop because I can buy a small amount at a time and they take up very little space in my tiny pantry that way. Bring water to boil in medium saucepan. Add potatoes; cook 7 minutes or just until tender. Set aside. Heat oil in large ovenproof nonstick skillet on medium heat. Add broccoli florets and onion; cook and stir 5 minutes or until softened. Stir in potatoes. Reduce heat to medium-low. Wisk eggs,Italian seasoning and milk until foamy. Pour mixture into skillet. Add to broccoli and potato mixture. Cook without stirring 5 minutes or until eggs are just set on bottom. Arrange sliced tomatoes on top of egg mixture. Sprinkle with cheese and turn burner to low heat. Cover and cook until cheese is melted. 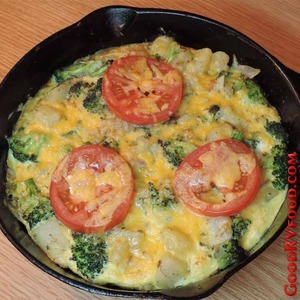 Frozen or dried hash browns may be used, follow directions to cook then add broccoli and onion before adding eggs. Italian seasoning is recommended but any of your favorite herbs and spices may be substituted.